Since it’s the ultimate expression of prestige, there are many that dream of owning a gold Rolex watch. But perhaps some think that these luxurious timepieces are completely out of reach. While there are certainly plenty of gold Rolex watches that carry hefty price tags, there are also some that are much more affordable. Enter the Rolex gold shell Air King. Let us give you the inside scoop! Gold shell, also known as gold cap or gold filled, is a process that was used by Rolex starting in the 1950s. A thick layer of yellow gold is bonded to the stainless steel case to offer the yellow gold look without the eye-popping prices. Gold shell is not to be confused with gold plating, which has a much thinner layer of gold. Therefore, gold shell is more precious (in terms of metal component) than gold plating. Rolex often referred to their gold shell watches as “Golden Eggs” in their marketing materials. Several vintage Rolex collections have gold shell options including Oyster Perpetual, Date, and Air-King. 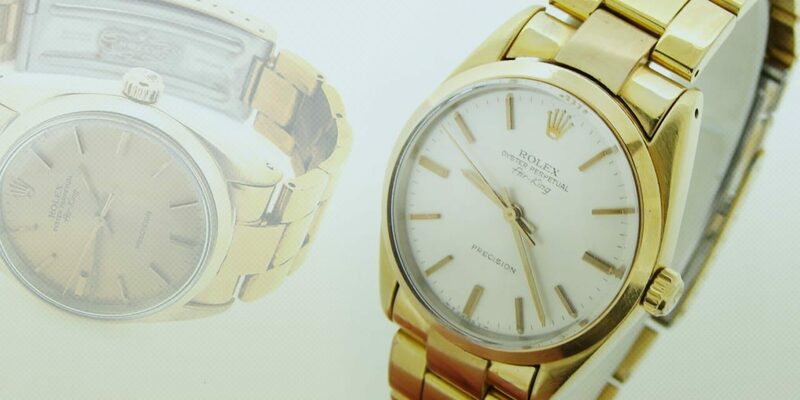 Rolex produced the first gold shell Air King model with the ref. 5520. Like the majority of Air King models, the gold shell Air King ref. 5520 sports a refined 34mm Oyster case. And for this particular model, Rolex capped the stainless steel case with a heavy layer of 14k yellow gold. The gold shell Air King ref. 5520 includes a straightforward and classic dial. There are the three gold center hands, the gold stick indexes, and the gold Rolex coronet. 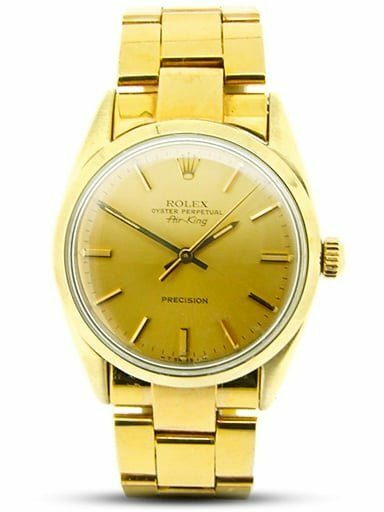 There’s also a little bit of text including “Rolex Oyster Perpetual,” “Air King” in the famous vintage style font, as well as “Precision.” Precision on the dial indicates that the gold shell Air King ref. 5520 runs on the Caliber 1520 automatic mechanical movement. While the dial is straightforward, there are several color variations available including silver, black, gold, and others. Interestingly, there are even some gold shell Air King ref. 5520 with the Dominos Pizza logo on the dial! In the 1980s, Dominos used to run the “Rolex Challenge” where franchises were rewarded for reaching sales goals with a Rolex watch. 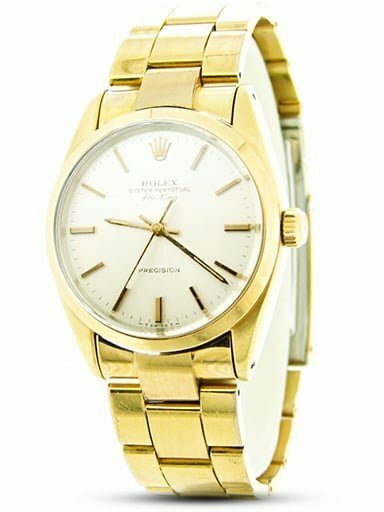 The Rolex gold shell Air King ref. 5520 continued to be in the brand’s catalog until 1986 when it was discontinued. Although it’s not a particularly common Rolex watch, there are some Rolex Air King ref. 5520 available in the secondary market. While 34mm may seem small to some, remember that many of the top watchmakers are now going back to smaller and slimmer style watches. Particularly as a dress watch, 34mm is very elegant and can easily fit under a dress shirt cuff. So if you’re looking for a gold Rolex watch with a timeless look that will not empty your pockets, then take a closer look at the gold shell Air King ref. 5520. Whether on a matching gold bracelet or fitted with a sophisticated leather strap, you don’t want to miss this Rolex watch. For more sophistication, we welcome you to view our fine collection of used Rolex Air King timepieces here at BeckerTime.